The IP cameras or video surveillance cameras – better known as IP CAM – are the new frontier of the burglar alarms, especially thanks to the very simple installation and integration with the smartphones allow you to quickly and easily view the interior of your home or the external via Android or iOS app. All this is possible because they take advantage of the direct connection to the wifi router via wireless mode or Ethernet cable, and can be remotely accessed via any smartphone or tablet with internet connection. The gem that makes this type of video surveillance, particularly interesting (not all of them are able to do it of course) is that most of them are able to record only when some movement is detected, and it is possible to set up an alert notification that informs us in real time. this suspicious movement in our house. All this allows us to increase security by minimizing the factor inherent in the memory needed to save these movies. But what are the factors to consider when buying a good surveillance camera, which can effectively become a real home alarm? Let’s find out together. The video output format can vary in resolution depending on the type of camera, ranging from 640 × 480 pixels to 1,920 × 1,080 pixels. This factor may seem obvious, leading us to choose IP CAM with fairly high resolutions to get the top shots but the downside is when we will see them, if our connection is slow enough we will struggle to see in a stable and optimal our shot. If we find ourselves in such a situation, it would be better to opt for a room with a lower resolution to decrease the traffic on our home line. The recording quality also includes the compression ratio offered by the recording format, which can be: H.264, MPEG4, MJPEG and JPEG. Also this is a factor not to be overlooked because the higher our relationship will be and our recordings will be less heavy. Among those mentioned the best compression ratio is undoubtedly the H.264. Some of the best surveillance cameras allow you to rotate (remotely controlled) to increase your range of action. There are also fish eye optics that maximize the field of view without any need to rotate the camera. As for the sensors can be equipped with Motion Detection technology, able to capture the movements within the range of action of the camera and so start recording and / or send a notification to your smartphone. Another interesting sensor that tries to solve the problem of the non-infinite range of action of the rooms in question and is what allows them to ” listen ” to any noise and once detected start to record. Last but not least, let’s analyze the data-storage aspect. This aspect is quite varied and varies from IP camera to IP camera. The most widespread method of storage is undoubtedly NAS storage, a network device that provides space for storing any type of data. Then there are cameras that save data on a proprietary cloud and finally there are rooms with a micro sd slot on the back that save data directly on the media. Once analyzed the main aspects that distinguish the various IP video surveillance cameras on the market today we can now move to our recommendations for purchases, obviously taking into account one of the main factors for the purchase, the quality/price ratio. Why buy a video surveillance camera? A Wi-Fi surveillance camera located on the front door, above your garage or connected to a rear entrance is able to provide a glimpse of what actually happens outside, even during the night, either someone who tries to steal or animals that pass through the trash cans. You could warn with a sign of the dangers and the presence of the surveillance camera, to scare the bad guys. An IP Cam should help you identify someone, record every suspicious movement and be able to be controlled at any time. If this is not enough you can monitor the safety of your home 24 hours a day, 7 days a week, especially if you are on holiday, perhaps receiving notifications for any suspicious activity. Many surveillance cameras are equipped with onboard speakers. This means that you can record an audio message with your smartphone and send it to the IP camera that will play it. If the verbal threat does not work, there are IP cameras that can provide an alarm that alerts neighbors or secure numbers that can intervene quickly. Of course, you can save movies for later viewing. Some surveillance cameras also integrate with other smart home systems to activate alarms, lights, thermostats and other devices when motion is detected. Before leaving you to our selection, here is the top 10 of the best-selling surveillance cameras at the moment. The ranking is constantly updated automatically, every day. 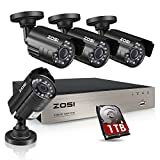 1 ZOSI 8CH Security Camera System HD-TVI Full 1080P Video DVR Recorder with 4X HD 1920TVL 1080P Indoor... 1,740 Reviews $179.99 See Offers! 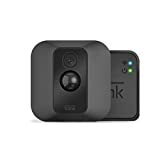 2 Blink XT Home Security Camera System with Motion Detection, Wall Mount, HD Video, 2-Year Battery... 5,652 Reviews $129.99 See Offers! 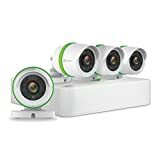 3 YI 4pc Home Camera, 1080p Wireless IP Security Surveillance System with Night Vision, Baby Monitor... 606 Reviews $119.99 $119.98 See Offers! 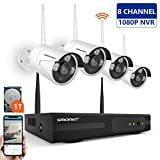 4 【2019 New】 Wireless Security Camera System,SMONET 1080P 8 Channel Video Security System(1TB Hard... 442 Reviews $229.99 See Offers! 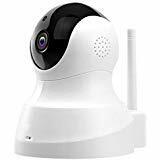 5 TENVIS HD IP Camera- Wireless Surveillance Camera with Night Vision/ Two-way Audio/ PTZ, 2.4Ghz Wifi... 3,698 Reviews $49.99 $37.99 See Offers! 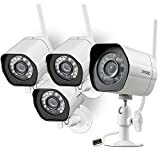 6 Zmodo Wireless Security Camera System (4 Pack) , Smart Home HD Indoor Outdoor WiFi IP Cameras with... 4,225 Reviews $115.00 See Offers! 7 ZOSI 8-Channel HD-TVI 1080P Lite Video Security Camera System,Surveillance DVR and (8) 1.0MP 1280TVL... 431 Reviews $219.99 See Offers! 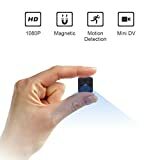 8 Mini Spy Hidden Camera,NIYPS 1080P Portable Small HD Nanny Cam with Night Vision and Motion... 102 Reviews $69.99 $36.99 See Offers! 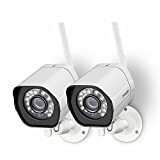 9 Zmodo Wireless Security Camera System (2 Pack) , Smart Home HD Indoor Outdoor WiFi IP Cameras with... 5,286 Reviews $65.00 See Offers! 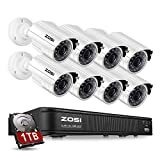 10 EZVIZ FULL HD 1080p Outdoor Surveillance System, 4 Weatherproof HD Security Cameras, 4 Channel 1TB... 775 Reviews $298.99 $199.99 See Offers! Now that we have seen a nice overview of what are the cameras of video surveillance and who (and why) should buy them, we are ready to list those that we believe are the best in the industry for quality / price ratio. Yi is a brand that you have met perhaps thanks to Xiaomi. This Yi Dome is endowed with good functionality and excellent quality in shooting. It has a wide-angle lens of 112°, capable of rotating for 345°, it is possible to make a 4x zoom of the shots, it is equipped with night vision and through the two-way audio it is possible to capture the sounds and send them (remotely maybe ). As far as the sensors are concerned, on the other hand, we find movements and noises and is able to send reports via email in case of strange movements at home. In all respects, in short, for a device that maintains a very good quality / price ratio. As for the storage here too we find a MicroSD slot that can accommodate a 32gb card and through the proprietary application, very user friendly, it will be possible to manage up to 12 rooms at the same time. Another YI product, another satisfaction. This IP Cam video surveillance is able to record 1080p/15 fps video with a wide angle viewing angle of 111°. It has 2.0 mm lens (focal length) and zoom: up to 4X. Its price is also quite cheap. Other interesting features to report are the two-way audio with built-in microphone and speaker, night-vision mode up to 5 meters with 8 discrete non-invasive LEDs (for babies and children when they sleep) and 940nm infrared sensor. You can control it via your smartphone thanks to the YI Home App app (up to 12 cameras), which can be downloaded for free from the Google Play Store or Apple App Store. 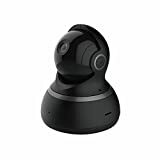 YI 1080p Home Camera allows you to record on smartphones and PC or on a micro SD card up to 32 GB. This D-Link is one of the most sold on the market in terms of surveillance camera. The shooting quality is 640 × 480 pixels, is equipped with infrared LEDs for visual notation and a motion sensor that alerts us via sms or e-mail when it is activated. As for storage, on the side is a housing for micro SD cards (maximum 32gb) and does not require the use of NAS devices. It does not have a POE connector and the only way to interface with the network is via WIFI. 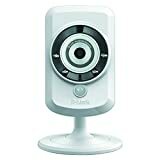 And finally as regards the sector of applications and portals on which you can access to view movies and change any settings, D-Link provides the mydlink system that allows you to easily control our camera from the outside. Yet another product by Yi, specialized in the sector. 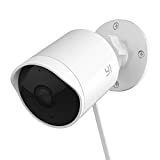 The Yi Outdoor camera is a video surveillance camera that should not be mounted indoors but on the outside. It has a high resolution (1080p), waterproof and with integrated microphone and speakers. This Arlo deserves one of the places on the podium given its simplicity of assembly and use. Netgear has done a good job both from the hardware point of view, this camera allows you to record in fullHD and has a field of view of 130°, and from the software point of view for its app that allows you to manage 4 IP Cams simultaneously configuring them in a simple and fast way. As for data storage in this case, we have the opportunity to use the cloud owner having 1 GB free. As it can be guessed from the model name we are dealing with a higher-end IP camera than the aforementioned Arlo Q. This is declared by the owner as the room that does not fear darkness or water. Yes, the surveillance camera in question is weatherproof and is equipped with a system with RGB-IR technology that allows the fullHD sensor (with 130° viewing angle) to capture images at night with a uniform illumination. 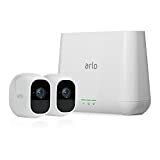 Arlo Pro (as well as its previous version) are powered by a battery, so they do not require cables of any kind, which makes it extremely easy to mount even in less ” accessible and more complex ” areas of the house. 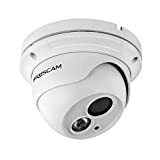 This external Foscam IP CAM is equipped with HD video quality, H.264 compression and has motion detection to alert any suspicious movements via email. Thanks to its IR-LED it is able to illuminate and reach distances that stand on 20 meters and is compatible with the PoE (energy and data through the same Ethernet cable). Remotely it is possible to reach it via DDNS service (if configured by the user).